Who doesn't own a pair of black shoes? I'm sure that we all do, so that means it's a favorite/ timeless piece not just in my closet but in yours as well. Now let me tell you something that already is no longer a secret: I like black shoes but I LOVE , love, love colorful/ printed ones! So, if I have to choose a pair of black shoes, I'm looking for something different, with a little extra something as these lace-up pair from today's post, which is my Nr.2 favorite/ timeless piece from Lulu's.com. I love your shoes and coat! What a fabulous look! You look amazing in black and white too… I see you couldn’t resist adding some color …Love the touch of green in the sunglasses!!! That coat is everything!! Beautiful!! You look absolutely gorgeous my dear! now THIS is how you do black and white, stunning! This confirms how mush I love B&W. That print is amazing and I am in love with those shoes…GORGEOUS! Beautiful coat! WOW! And love the shoes too. Amazing look V! Just saw this on IG and had to hop over for the deets! 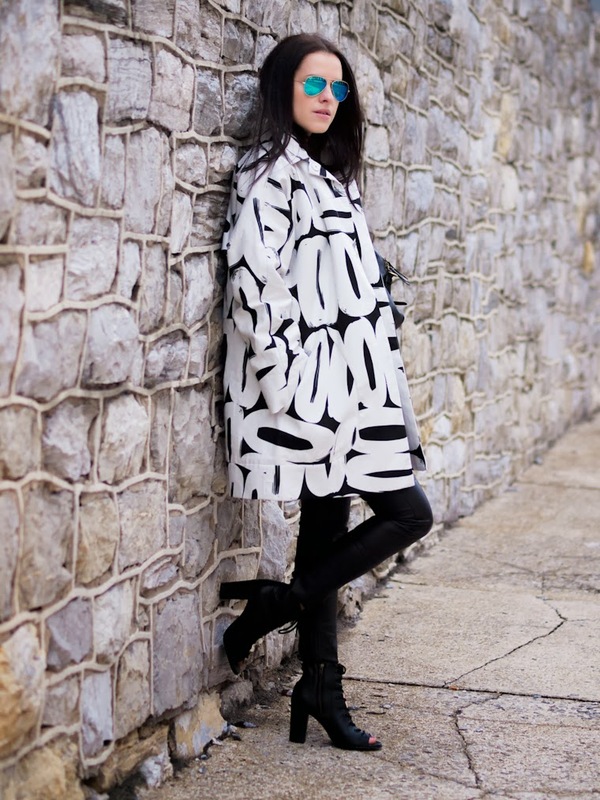 Totally digging the graphic b/w looks- so fresh for transitional weather! TOP !!! JACKET, SHOES, PANTS – literally everything works perfectly together !!!! That coat definitly makes a statement.